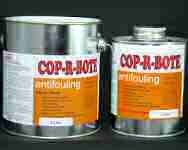 Cop-R-Bote Antifouling Paint 3 litre : Boatcraft Pacific, the home of wooden boat building. An ultra long life antifouling paint. It is actually an ultra fine copper powder dispersed in an epoxy resin. In effect you are copper plating the bottom of your boat. Depending on water temperature and the nutrients in the water, it does need a periodic wipe with a scotch brite pad to remove the bacterial slime. Provided this is done, it can last for many years, 5 maybe 7 maybe.... who knows. It is an ideal antifouling paint for multihulls which can be beached periodically at high tide to wipe the slime off and especially good for trailer boats which spend months in the back yard and then a period in the water. This antifoul is very hard and will resist the knocks and bumps of trailers or going on the beach. Kit consists of 2 litre of resin and 1 litre of hardener. Coverage is about 10 to 11 square metres per litre, we suggest thin coats, which you take real care to make them smooth to minmise sanding. We suggest 3 coats. Great for polyester fibreglass boats, it significantly reduces the risk of osmosis. Not suitable for aluminimum hulls and we do not recommend this antifouling paint for steel hulls. The hardener is classified as Dangerous Goods for transport, so it must go by road transport. .